Delivery times may vary, see cgv contact us before the purchase to have the exact deadlines. And especially during the months of August and July or almost all suppliers are closed! By clicking on immediate purchase, the customer certifies having read and accepted the general conditions of sale. Do you know the theory that we only use the twenty percent of our brain? With forcemaster 3 you will use one hundred percent ... To improve our most advanced control unit we have thought big, starting from the goals achieved so far. This is how force master 3 is born, a futuristic control unit for both hardware and software. The original control unit of the scooter to analyze the title and adjust the carburation accordingly, is normally interfaced with the lambda sensor installed on the muffler. Force master 3 intercepts the signal from the original probe, sending the values ​​generated by a "virtual" lambda to the primary unit and allowing a dynamic and personalized management of the title at all times when the original system is programmed to analyze the results. It is finally possible to manage the title of the carburation between the idle zone and that of passage, that is to say for all these regimes of turns and these conditions where the control on the action of the lambda would prevent any intervention. Thanks to a more evolved circuit the electrical disturbances normally present on the signal of the throttle position have been eliminated, so as to allow a more precise identification of its real degree of opening and to appreciably improve the response times, all at the same time. Advantage of engine performance and efficiency. With a hardware so refined, it could not miss a microprocessor with a very high capacity of calculation allowing malossi technicians to introduce new software strategies and to exploit all the potentialities of force master 3. ± 14% to low / high / mid. Limiter of revolutions: + 1000 rpm. Temperature range = -20 ° C + 80 ° c. Minimum operating voltage = + 7v. Maximum operating voltage = + 16v. Average absorbed intensity <- 200ma. Particular attention has been paid to improving the user interface, using a graphical display that shows the main functional parameters of the device. Position of the carburetion correction switches. Force master 3 has a communication line can to which, in the future, it will be possible to apply any extensions. Automatic tuning (autotuning) by external linear lambda. Module for ignition phase control. Possibility of updating cards by the user, by means of communication tools. 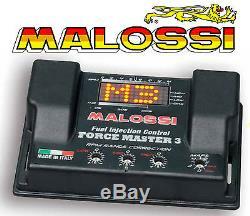 The incredible innovations of Force Master 3 combine with the pioneering features of all Malossi control unit models. Fuel correction cartographies 8 20 break. Fuel management during the engine warm-up phase. Extension operation besides limitator laps. Where possible, read engine parameters by kwp2000 k-line. User carburising compensation, by three external trimmers, ± 14% at min / medium / max. Immunity of electromagnetic interference present on the vehicle. Wiring with cables and sleeves compatible with oils and hydrocarbons with temperature range -20 + 150 ° c. Yamaha t max 530 2012 (j409e). The 4 cards available on the master force 2, became 8 on the master force 3! Double the choice guarantees the certainty of always finding the right cartography compared to the various combinations of malossi products installed on your scooter! Malossi technicians have studied each cartography to offer the end user the optimal solution for each style of development, developing them with such precision that it guarantees a consistency of performance in the most disparate conditions: a true electronic prodigy Bmw c sport 600 euro 4 - ct 650 euro 4. Other thousands of pieces with. The deadlines can vary between 5 and 15 working days, contact us before the purchase. New parts in their packaging. Helmets, rain gear, clothing and anti-cold accessories, tire warming blankets, etc. 03.25.55.74.71 Monday to Friday from 9h-12h to 14h-18h. 06.62.69.50.19 from 9h to 19h / Monday-Friday. The item "malossi yamaha tmax 530 t-max cdi injection force master 3" is on sale since Sunday, September 21, 2014. It is in the category "auto, motorcycle parts, accessories \ motorcycle parts \ other". The seller is "misterbike-fr" and is located in saint-dizier, champagne-ardenne. This item can be shipped to the following countries: france, belgium.